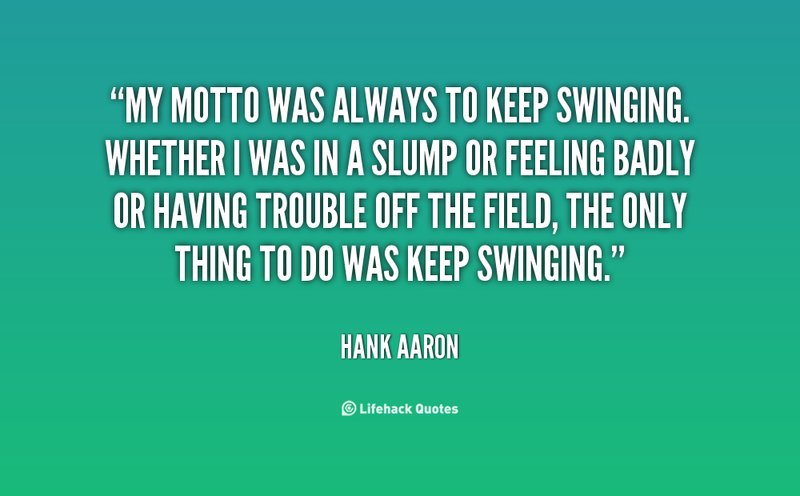 What Should You Keep Swinging At? One of my guilty pleasures is coaching youth baseball. With two sons smack dab in the middle of their Little League baseball careers you can generally find me with a glove in my hand six days a week from March through June. And while neither of my boys are going pro, they enjoy the game and the camaraderie it provides. This year’s been particularly challenging, with more losses than wins and more cold rain than warm sun. My youngest son’s 9-10-year-old team welcomed three newcomers this year, which is very odd in an age when boys start playing baseball at 5 or 6. It’s a huge learning curve. There are rules to follow, subtle nuances of the game and opposing pitchers throwing hard and not very accurate. While two of the boys are catching on, one boy, Vinnie, is having a rough time of it. At about four feet tall he’s the smallest on the team and although he has a lot of spirit, the game is overwhelming him at times. Getting in the right position, knowing where to throw the ball and staying focused are a challenge. His season started, get this, by getting hit in the neck on his very first plate appearance. Since then he’s been terrified of the ball, aggressively stepping out of the batter’s box whenever the pitch is thrown. At this age that’s an automatic strike. Knowing this, coaches, parents and teammates have been urging him to stay in the box. That’s easier said than done when you’re 9 and staring down a pitcher just 44 feet away. Extra batting practice and coaxing hadn’t changed the outcome of Vinnie’s at bats. Until last night. After striking out unceremoniously in his first plate appearance, Vinnie stepped into the box in the top of the fourth inning with two outs. I was the first base coach and went through the regular routine of commands, “Stay in there, plant your back foot, hold your hands up high.” I could hear his dad from the stands, “Just swing, Vinnie!” This all sounds like a broken record that Vinnie doesn’t want to listen to, until now. After taking one strike and one ball, Vinnie found that one pitch he was looking for, and instead of jumping out of the box, he put his bat in motion and made contact with the ball. Now if this was a Hollywood script, he would have hit a home run, but in our version of Little League baseball it was a tap back to the mound. That didn’t stop Vinnie from running with all his might and sliding into first base. Out by two steps. As he got up and dusted himself off, his teammates cheered wildly. The bleachers (and all 14 parents in attendance) erupted. I wish you could have been there to see the look of pure joy on this kid’s face. He overcame something he’s struggled with for the past two months that’s likely kept him up at night and made his stomach turn as he sat in the back seat of dad’s car on the way to the field. Let’s face it, Vinnie could have quit base-ball shortly after that beanball and nobody would have questioned it. But instead he stuck it out, failure after failure, until he got that 800-lb. gorilla off his back. I think about this in the travel business and how we’re quick to let ideas go when faced with rejection, or quit on a project too soon, admitting failure without really trying. If we put the effort into our craft that Vinnie did in his, I wonder if our outcomes and prosperity would be different. Now just for a minute, imagine the joy on your face when you finally achieve that breakthrough. It’s like being 9 years old all over again.